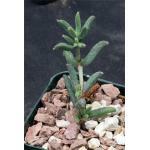 From an area encompassing the border of the Western and Eastern Cape Provinces, and extending eastwards into Lesotho and the Free State of South Africa, this species does not have succulent above-ground parts. 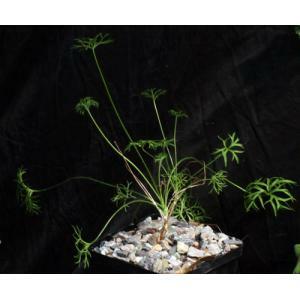 Instead, it has very interesting tuberous roots that are red and quite large. The leaves are deeply divided, which is why it once was known as P. dissectum. The flowers are white with minute red lines. These plants are seedlings in 5-inch pots.